Turtle Islands are in the Sulu Sea just north of Borneo and between the Malaysian and Philippine border. There are three islands, Pulau Selingan, Pulau Bakkungan Kechil and Pulau Gulisan and between them they cover an area of 1,740 hectares. 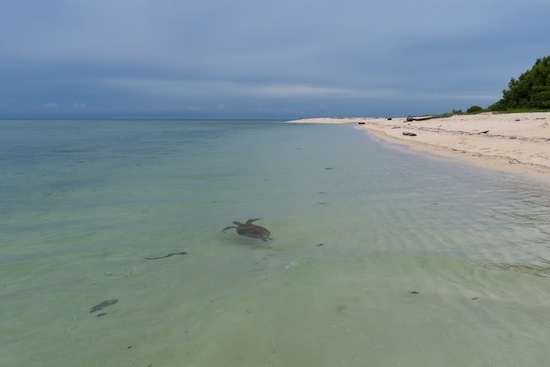 Selingan Island is the second largest and this is where you can find the park’s headquarters, the sea turtle hatchery and where tourists are able to come and stay for a night to see the turtles. The Turtle Islands are uninhabited islands dedicated to rescuing endangered turtles and protecting their eggs and hatchlings. Both the Green Turtle and the Hawksbill Turtle return to Turtle Island, where they were also born, to lay between 80 and 180 eggs. It is instinct that draws the female turtles back to their birthplace to lay their own eggs, presumably because she believes it is a safe place to lay. Unfortunately, this instinct has made turtles vulnerable to poachers who collect the eggs and sell them as a delicacy. 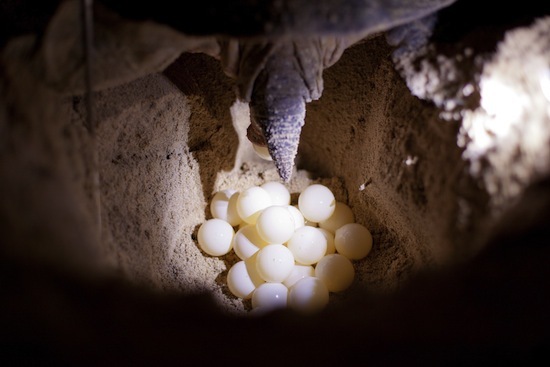 Turtle eggs are also in danger of natural predators such as lizards and birds. It is estimated that just one in every 1,000 eggs will make it to become an adult turtle, so protecting these precious eggs is vital. This is why the conservationists and rangers on Turtle Island have such a tough but vital job. 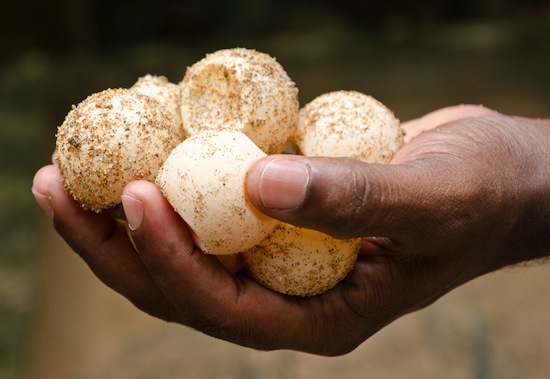 The rangers collect around 600,000 eggs each year and they are placed in a nest in the sand until they hatch. 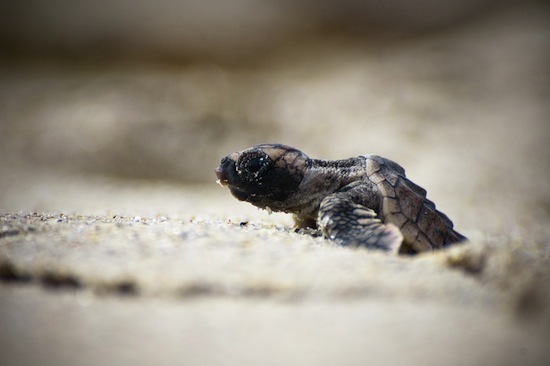 They are then released in the biggest group possible to give the turtles the greatest chance of survival. If they are released individually then it is likely they will be eaten in minutes but when they are released in a group at least a few of them will make it to safety. 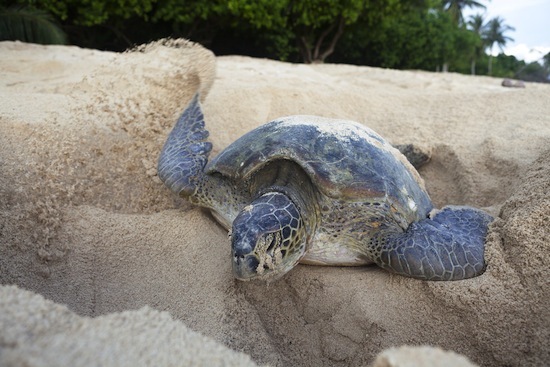 Not only are the rangers on Turtle Island protecting the eggs but they are also educating tourists and the local community about the dangers that sea turtles face. It is heavy trawling, coastal pollution and development, plus consumption of both eggs and turtle meat that has pushed them towards severe danger of extinction. 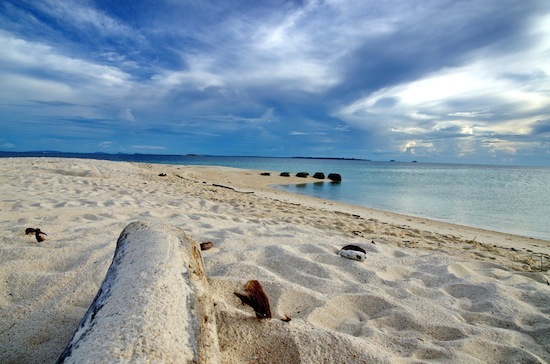 Allowing tourists to visit Selingan Island provides the project with much needed income. It also allows us to spread the educational message across the world and gives us a once in a lifetime opportunity to see turtles being laid, hatching and being released into the sea which, believe me, was one of the most amazing things I've ever done! We jumped to our feet as though a fire alarm had been called and followed our guide out onto the dark beach. Walking along the shore, we followed the light from his torch and made our way to a mound of sand that had been tossed aside by the female turtle as she made a nest for her eggs. 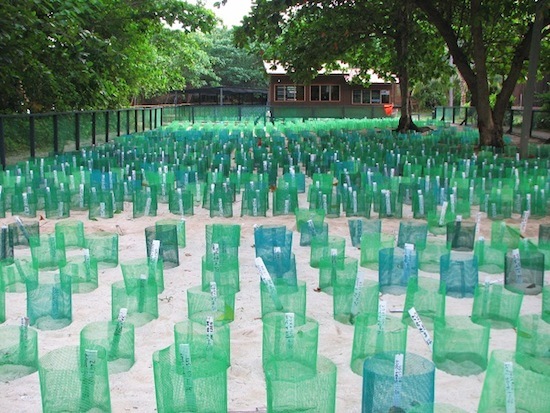 There is space for 50 tourists to stay on the island but everyone is split into small groups so only a few people at a time will be present when the turtle lays her eggs. We gathered around in hushed silence and I’m sure the entire group held their breath until the first egg popped into the hole like a ping pong ball. And then another. And another. Within 15 minutes the turtle had laid 65 eggs! We counted them silently with no one saying a word but occasionally exchanging glances that expressed our amazement at this incredible moment. She swiftly used her fins to scoop the sand back over her nest before slowly making her way back out to sea. The rangers then carefully dug the eggs back up and transferred them to the hatchery where they would be safe from predators until they hatched. 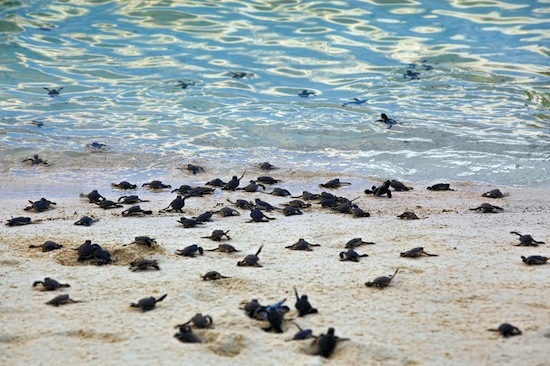 The following morning we gathered on the beach to see 50 newly hatched turtles being released into the sea. It was strangely emotional watching them make their break for freedom as they struggled across the sand. At just one day old, their instincts were strong and pulled them towards the water like a magnet. Well, for all but one who went in the wrong direction and had to be carefully steered towards the sea. We wished them luck and crossed our fingers superstitiously in the hope that at least one of these little turtles would make it in the big bad ocean and be back here in 20 years time to lay eggs of her own. Chat to a Travel Expert about booking a holiday to Borneo today. Monica is a travel blogger with a love for stylish adventures around the world. She blogs over on The Travel Hack about everything from weekend breaks, stylish hotels, exotic holidays and adventure travel.